Interior design is easy when you add this high quality Safavieh Courtyard area rug to your home. Keep it classy, quality, and stylish with this indoor/outdoor rug made from plush synthetic material. This rug is machine-made for convenience and quality combined. Include this floral plants patterned bone rug in your living spaces for a high quality and high fashion look. Courtyard Jaden Aqua / Cream 2 ft. x 3 ft. 7 inch Indoor/Outdoor Area Rug Place this Safavieh Courtyard area rug in your dining room when you need a splash of style. Designed to decorate an indoor/outdoor space, this plush synthetic material rug is high quality. The machine-made construction of this rug makes it high-quality and durable. Modern style meets quality in this geometric patterned blue rug. 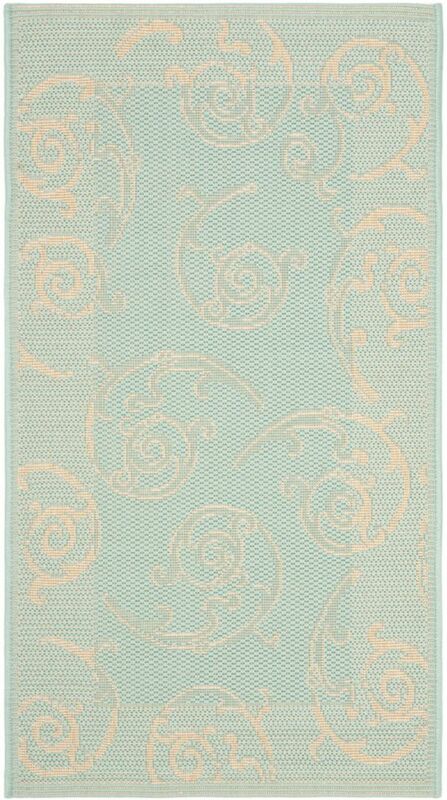 Courtyard Jaden Aqua / Cream 2 ft. x 3 ft. 7 inch Indoor/Outdoor Area Rug is rated 4.5 out of 5 by 2. Rated 5 out of 5 by KiKi from SIMPLE, ELEGANT AND VERY DURABLE! This rug is very pretty in person. It comes rolled up so just unroll it and lay it flat. The roll marks will go away. The color is soft and subtle. I originally bought it for my porch but have now decided to use it inside the house. It is really well made. The weave is nice and tight and the rug is very strong and durable. I have had it in a high traffic area for over a month and it still looks brand new. The pattern/design is simple but elegant. It's very classy. I highly recommend it!